Having a home security system installed offers a greater level of protection for your family and your home. Did you know it also helps you save on your home insurance rates every year? Since a home burglary happens about every 18 seconds in the United States, according to Zacks, and the average property loss is $2,251 per incident, insurance companies offer discounts when you install a home security system to prevent this from happening. The amount you will save on your home insurance depends on the type of alarm you have installed. The savings can be as much as 20%, which can really add up over time. The best way to ensure you get the highest discount is to make sure you have a home security system with central monitoring. A home security system is just one piece of the puzzle. Just by adding this level of protection to your home, your homeowner’s insurance company will likely extend a discount. If you have the security system hooked up to central monitoring, that discount will likely go up. In addition, when you add fire protection through monitored smoke alarms, you'll likely gain an even larger discount. This type of home security system will now protect you from fire, which could destroy your home rather quickly. Add in a sprinkler system and you'll get an even larger discount on your home insurance. Another level of protection you can add, which may help to boost your discount is protection from carbon monoxide. With a CO detector installed and monitored as a part of your home security system, you'll have even more protection, which means your insurance company will likely extend a larger discount. Finally, you can add in additional protections from busted pipes and other types of flooding for an even larger discount. All of these home protections can be monitored to ensure your home is as safe as possible, which keeps the insurance company very happy. When you add a home security system you'll lower the risk of your insurance going up over time, as well. This can be a benefit that keeps paying you back every year as you could keep your insurance rates from going up. Another way a security system can help to lower your insurance rates is by lowering the theft claim quota. If you and your neighbors get home security systems, the total theft quota for your area may drop, which helps to save everybody money on their home insurance in the area. There are many great reasons to have a home security system installed with full fire, carbon monoxide, and other protections. Getting a lower rate for home insurance is just one of the many reasons. However, it can help to pay for the system costs over time as your rates will become lower and you'll be less likely to see your homeowner's insurance rates go up as much over time. While wrought iron gates certainly add to the look of your home, they also add a feature for the security, as well. When you add a wrought iron gate to the entryway of your building, you add a level of security making it even more difficult for a burglar to get in. Not only will these gates help to keep burglars out, but they can also set up a type of security you usually only get when you live in a condo building. Any visitors coming to the property will not be able to access your front door without first going through your gate. The gate can be set up to include a keypad to ensure nobody gets in without the code or an automatic gate opening device. Most burglars are scared away by the look of a property. A security sign deters more criminals than the actual alarm system because it's intimidating. In addition, a wrought iron gate provides one more level a burglar must conquer to get inside. It's intimidating as the burglar has to try to climb it, trick it or find another way in. When set up correctly, a wrought iron gate will add a high level of security to the perimeter of your building. The wrought iron is already intimidating as a material. It's not like chain link or another cheaper material that's easily cut or maneuvered to let someone in. Instead, it's solid, intimidating and hard to bypass. The gate is just one part of the perimeter security system. You can match your wrought iron gate with a complete security fence to ensure your entire building perimeter is protected. Add in an automation kit and nobody can easily get in without your permission. You can even choose a gate that's tall enough to become extra intimidating. Match this taller gate with a taller fence for even more security. If you want to know who's at your gate before they get in, you can add an intercom. This can ensure you have to buzz them in just like in an apartment or condo building. You can find out who has arrived before they get past your gate and make the decision to let them in or leave them outside. The best part about adding a wrought iron gate to your entryway is the many design options. You can fully customize your perimeter security to ensure it looks amazing, adds to the property and does the job of keeping unwanted guests away from your home. When you choose a wrought iron gate for your entryway, you're communicating a clear message. It doesn't say everybody is welcome, but instead says, this property is well protected and only those invited will get in. This is a great way to ensure the security of your home and family. Plus, the gate can be customized to fit your specific tastes and style. The security of your business is vital in preventing break-ins to protecting the building from fire to protecting your computers. You must take measures to protect your business on all fronts or you could see it all go down in flames faster than you could have ever imagined. When it's time to set up your security budget for your business, you need to know what the most important factors are. You cannot just protect yourself on one front and avoid another. It's important to have full protection as this is your livelihood and the livelihood of all your employees. How Big Should Your Security Budget Be? On average, small businesses will spend about 6% to 7% of their annual budget on security. The number is a bit higher in the financial industry and a bit lower in the education industry. It will vary depending on the industry from 1% to 12%. When considering your security budget, it's important to focus on prevention first and response second. You want to be proactive and protect your business on all fronts. However, it's also important to have a plan in place to deal with a potential incident. Protecting your business from break-ins, fire, environmental disasters, employee theft, cyber-attacks and any other possible attack is the first step. If you can prevent an issue from happening, you won't have to deal with the consequences. Make sure you consider all the possible prevention methods in your budget. You don't want to simply install a security system with cameras and call it a day. Instead, you want a full business security system complete with fire protection, environmental disaster protection (carbon monoxide, leak detectors, etc.) and security cameras. Of course, you also want a system to protect your computers and sensitive data. 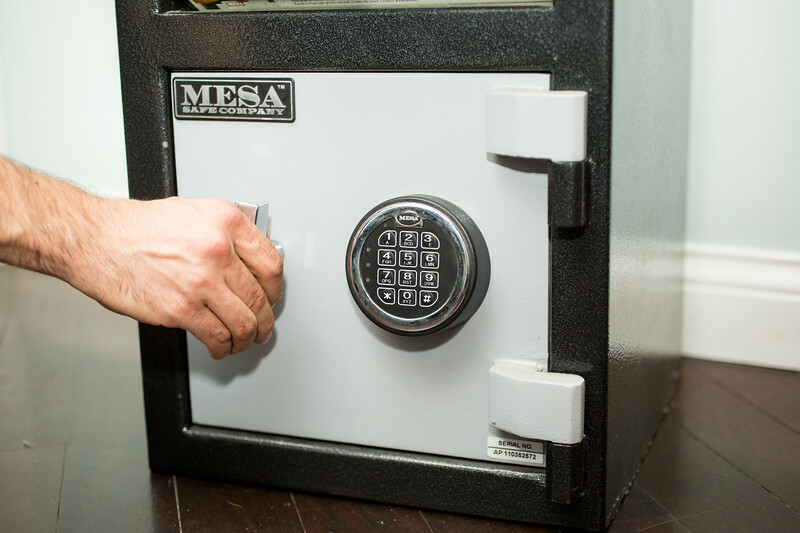 You may want to install a safe too for the most important documents. If a break-in is one of the major concerns, consider beefing up your entry points. Installing locks and other hardware making it much more difficult for a criminal to enter your business will go a very long way. You can also use controlled entry to ensure the only people getting in and out of the business or at least certain areas of the business have to have a code or a swipe card. Along with protecting your business from threats, you need to consider the ongoing expenses of security in your budget. Some forms of security will only need to be paid for once, but others require a monthly fee to keep them current. Make sure you consider these expenses in your business security budget. How will you deal with a break-in or someone attacking your computers? What if a fire happens or environmental disaster strikes your business? Make sure you consider the necessary insurances and protections you will need to carry to protect your business from the worst case scenario. When setting up your business security budget, there are several things to consider. You have to protect your business on all fronts. Having an expert assess the risks of your business is a good place to start when trying to figure out how much security will cost each year.